Those of you that have been reading this blog for awhile know that I like to make my husband we like to build furniture. Nate likes to try to come up with his own plans but sometimes it’s easier to not have to reinvent the wheel. That was the case with our farmhouse table. Ana White’s plan for the Big Ur Farm Table was very straightforward. We loved the look of the table and there wasn’t much to improve on. Ana White's site has also been super helpful with any building related questions that Nate has when I show him a piece of furniture and say “Please build this dear love of mine.” She introduced us to the Kreg jig and our lives have never been the same since. Seriously. True story. 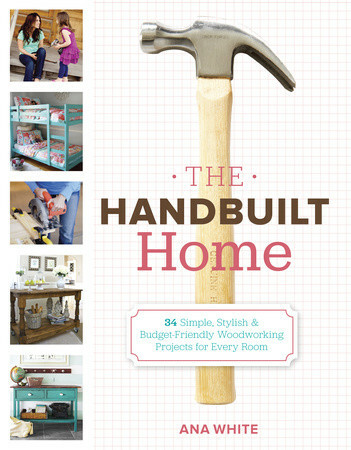 I was recently asked to review Ana’s book, The Handbuilt Home. The book is full of furniture plans for every room of the home. The book is very visually appealing with many photos of diagrams and completed projects. I enjoyed the first few chapters of the book that explain what tools are needed, what kind of wood to purchase for the various projects, and what type of finishes to use on the projects. The book also includes information on different types of cutting and assembly. After reading this book I almost thought I could build furniture on my own. Who needs that husband? Not me. Okay, wait. I do. I can’t cut straight to save my life. I am, however, seriously thinking about learning how to use a saw. Seriously. Baby steps. I won’t be wearing heels though if I do. That Ana is an impressive lady. Would you like a chance to win a copy of your very own? Enter below! Wait a second... sawing, hammering etc. with high heels??? I have a king size bed in my future, from Ana's blog. We are thinking of building a table... but I wonder if we should start with something easier, like a compost bin (the one the last people built-> not so good). I love the furniture that your hubby built. My hubby is handy but not the furniture building kind of handy....though we own every tool known to man. I'd like to have my hubs build some Ana White furniture! I even asked for a Kreg Jig from Santa! It would be nice to know how to build things...in case I ever have the patience to do it. I want to build a bench and cubbies for my entryway. Right now I am working on a set of pipe shelves for my kitchen wall that include a drop down table. It will solve half the "small kitchen" problems we have right now. This book would be awesome! for me it is my dad i had him make two end tables. Angela m.
and i want him (us) to build small bench for the patio. Angela m.
We want to extend our deck, John needs a real workbench in the garage, I'd like for him to build us a dining room table and a bed frame. I think I need this book! Imagine all the things I could find for the husband to build! Oooh, awesome! We really want to build built-in bookshelves around our fireplace. I'm scared. And put up board and batten in our front room. And I kind of want Jeff to build some shelves in Forrest's closet. I'll stop there. I want to build a stand to fit in my TV niche. My "to build" list consists of a coffee table and end table for our living room. Maybe one day I'll get really fancy and build and upholster a bench to go at the end of our bed. I want a farmhouse table like yours! Maybe even the same chairs too! I love your eat in area! so exciting, i really want this book!! On my to-build list is a LOT of things...some built-ins are the highest priority :). Jesse and I are planning on building one of her dining tables soon! What a nice bed you built! I would love this book for me to have ideas for my son to build!! An entertainment center! And I have my eyes on a few of the designs at anna white already! I would love to build a shelving unit for our living room, complete with a spot for a fireplace. First, I think we might try to finish our bar height desk area in our office. we're waiting on a house before buying power tools but who knows - maybe this book could change all of that! We will need to build a new dining table once we buy our next house! I just want to learn how to use some tools!!! Maybe eventually I could rework my daughter's closet. I will build this bed headboard for sure, go me! I think I like power tools more than my husband does. So someday when we actually have space to use and store them I'll probably be the one making things. I really want to build a headboard for my bed! And some kind of storage unit! Love your blog. I would love to win a copy of the book. We're building a re-do of your farmhouse table...with my dad's help! Would love to build lots of things. First up, headboard! I'd love to build a table just like yours. Love! I would (if I would have help- aka husband) build a clean line (with lots of details) desk! I love your West Elm inspired headboard and would like to build one for our guest room. I found your blog via stage of life. I think I have used the very same phrase before, "Please build this dear love of mine." I'd really love a farmhouse table like yours! huge book shelves for our obscene number of books! I would love to build outdoor furniture from some of Ana's plans. Your farmhouse table looks great! I have several of Ana's plans printed out and set aside for when i have a little time off. My favourites are her coffee tables thought...that's first on the list! I would LOVE for my husband to "suddenly" like to build things...perhaps this book would be inspiration! I've been begging my husband to make me a new, kid friendly kitchen table. I've also mentioned a headboard, but he likes to pretend he didn't hear me. haha! I can't find a table/desk for a craft area so I'm thinking I may need to make my own! I made a farmhouse table using one of Ana's plans online, and I think it came out pretty awesome. Next will probably be a console or coffee table. As a pharmacist (with family from Iowa) and new homeowner I LOVE LOVE LOVE your blog! My husband and I are actually going to make the Chestwick bed from Ana's website this weekend! Thanks for the great posts! I wanna build a big media stand that will blend into our Spanish style home! I love Ana's $10 Ledges! I love building, but don't have a lot of room to do big projects right now. It would be fun to do smaller projects though. I would love to make some built ins. I found your blog searching for a console table. I love the DIY table you did with the copper legs. You've inspired me, its next on my list! Thanks so much! I talked my husband into helping me build the farmhouse bed. I love how it looks and have other projects by Ana that I'd like to try out! I love the farmhouse table and there is an entertainment center that I have my eye on as well! I enjoy your blog and your cute pooch! I would love to build the folding sewing cabinet. It's much needed in my house! I want a copy of her book! Still love your bed. I have been eyeing this book and would love to win a copy! I recently just built some of her shelves I saw on her blog. I would love to win a copy of her book to find some other fun ways to improve my new home! Ana is an inspiration...there are soo many things I want to build. Looks like fun! Maybe we'll have a free weekend or two to actually complete a project in the next 6 months. At the top of my list is her spa bench! I want to build a bed. But I thought I thought I'd start small and do a less complicated project. I would love to build a storage bench! We have this giant felled tree that I want to chop up and make into end tables... and of course by "I", I mean "D". I want to build a garden "shed" that I want to use as a writer's retreat or artist studio. I would love a storage bench that I could use to put our shoes on and off when we come in the house.